I am naturally wired to be happy - or at least always strive to be happy - so when things get a little bit crazy crazier than usual, I turn to my fool-proof happy places. I'm lucky because I've always been in the vicinity of bookstores. The first time I read The Fault in Our Stars was on a Kindle reading app when I didn't have a Kindle yet. I loved the first few chapters so much that I dressed up, went to the nearest bookstore, and bought myself a hardbound copy of the book. Now, after particularly stressful work-days, I just drop by any of the malls in the Makati CBD and let myself be surrounded by books. Most of the time, I leave with a new book or two. Aside from the books I scored from the Philippine Literary Festival 2014, my most recent literary acquisition is Choose Your Own Autobiography by Neil Patrick Harris. Written in second person and inspired by the Choose Your Own Adventure books we used to devour as a child, Choose Your Own Autobiography lets you live NPH's life and make his choices for him! Will you achieve fame and success? Love? Failure? Or death by piranhas? Just make the right choices and you're good! It's such a fun read! Neil Patrick Harris is definitely one of my top favorite celebrities ever. For me, bath-times are sacred pockets of time within the day with which to prepare for the day ahead and to refresh before retiring for the day. 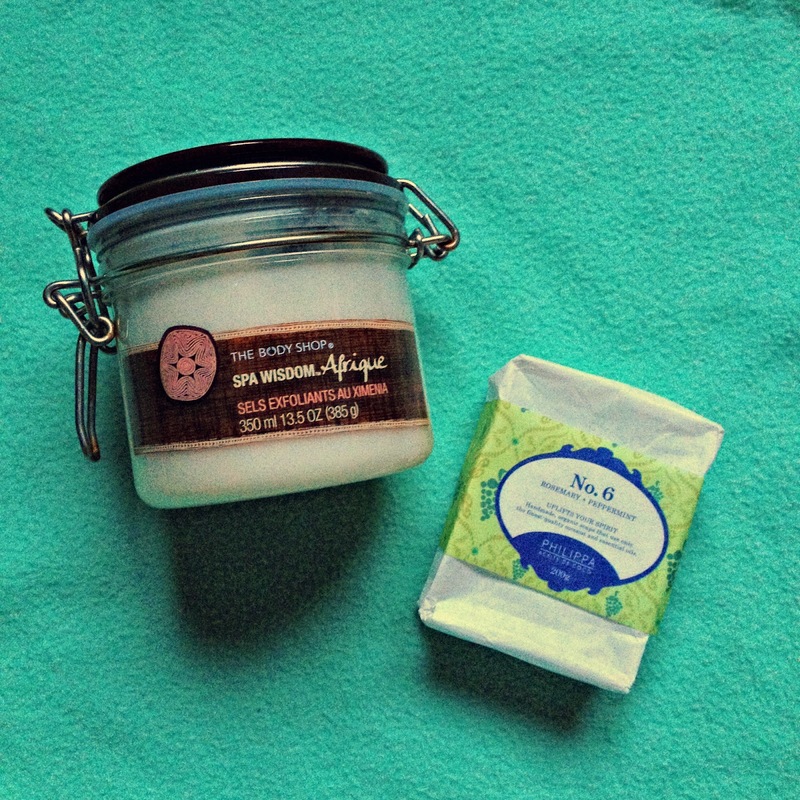 My current favorite bath-time companions are The Body Shop Spa Wisdom™ Africa Ximenia & Salt Scrub and PHILIPPA Aciete de Coco No. 6 Rosemary & Peppermint soap. I have a hyper-active sense of smell and I'm very picky when it comes to scents, but the new Fijian Water Lotus range from The Body Shop captured my heart (and nose!) hook, line, and sinker! One whiff and I'm reminded of the beach - another one of my happy places. (Can't wait for our beach trip happening at the end of the month!) I have the Fijian Water Lotus Body Lotion (250 mL/ P995) and Fijian Water Lotus Eau de Toilette (50 mL/ P1,395) and using them instantly transports me to where there's sun, sea, sand, and palm trees. I love it. Visit a The Body Shop branch near you, try it on, and see what I mean. Additional info: the Fijian Water Lotus Eau de Toilette and Fragrance Mist (100 mL/ P995) contain 100% organic Community Fair Trade alcohol from Cotopaxi, Ecuador. I have a lot more like the chapel my The Breakfast Club-mates and I go to before work, concert stadiums, and cinemas. How about you? Hope you're in your happy place today!